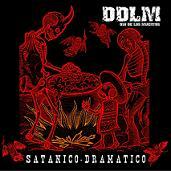 Review: "Dia De Los Muertos: Satanico Dramatico" - Sea of Tranquility - The Web Destination for Progressive Music! Dia De Los Muertos (meaning' day of the dead') is the new death metal / thrash project from Loana dP Valencia (Dreams of Damnation) on vocals, Alfonso Pinzon (Agony) on drums, Andres Jaramillo (Agony) on guitars, Adrian Villanueva (Brainstorm, Engrave) on guitars and Alejandro Corredor on bass. Satanico Dramatico is a really fun extreme metal album, and though it's pretty much on the short side, with songs ranging from 2-4 minutes long, it chugs along with plenty of ferocity and good old headbanging fury. dP Valencia, who many might also know as the Publicity/Promotions guru for Nuclear Blast Records, is in full growl mode throughout Satanico Dramatico, and she easily gives Angela Gossow from Arch Enemy a run for her money in that department. Thrashy riffs, pummeling rhythms, and Loana's lethal venom runs through tracks like "Fresh Meat to the Grinder", "Death's Embrace", and the mosh friendly "Las Calaveras Del Terror", and though it's all hardly original or mandatory listening, you can tell the band had a good time putting this all together, and in the end that's what it's all about. Solid, fun, thrashy death metal-check it out!